With the release of the fourth generation Optima in April, Kia has continued to revolutionize and advance its line up of luxurious midsize sedans. 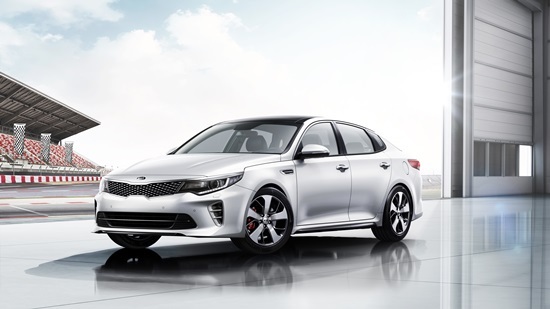 The new Optima’s prowess embodies the growth and progress of Kia Motors as an influential and innovative automobile manufacturer. 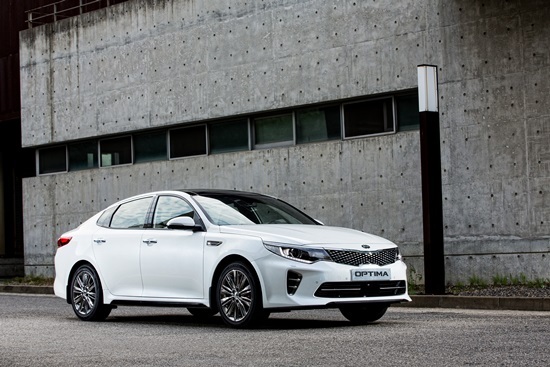 Today, let’s take a look at the inspiration and groundwork that have shaped the evolution of Kia’s midsize sedan into the dynamic and powerful fourth generation Optima. 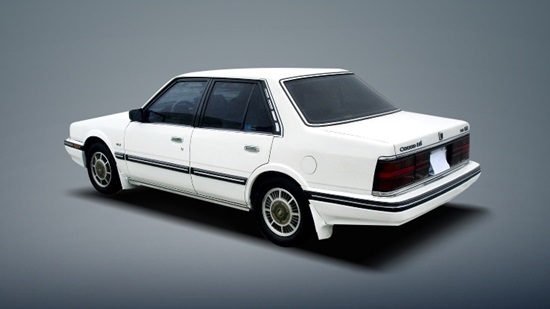 The Kia Credos succeed the Concord in 1995. Named after the Latin root ‘credo’ meaning belief, Credos caused a stir in the market for its responsiveness and outstanding handling. The Credos also received recognition for its excellence in design and its 1.8L DOHC engine performance. 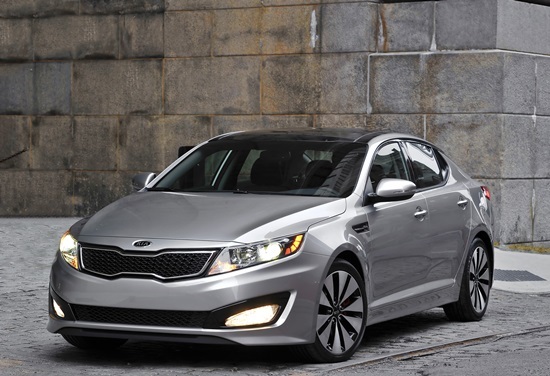 The release of the first generation Optima marked a major turning point for Kia’s midsize sedans. 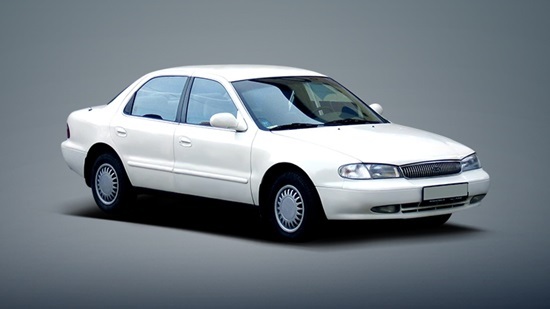 Incorporating a unique grille and an unprecedented 4-headlight design and establishing the signature Kia face, the sleek silhouette of the 2000 Optima would become the benchmark for future models to come. The second generation Optima, also known as the Lotze (named after the Himalayan peak, Lhotse) in Kia’s home market of Korea, featured the optimized handling of its ancestor, the Credos, and enjoyed immense popularity, becoming a top-seller in its segment in the Korean market only behind the Hyundai Sonata. 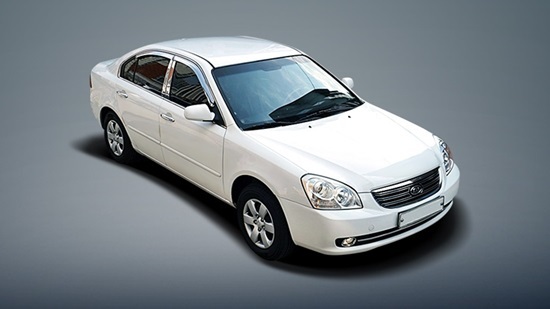 The third generation Optima, known as K5 in the Korean market, debuted in 2010 and featured a sportier, more sophisticated profile. The refreshed look, under the direction of President and Chief Design Officer Peter Schreyer, was honored at the 2011 iF Design Awards and was named the “best of the best” at the Red Dot Awards for its groundbreaking design. Remaining true to Kia’s dedication to quality and perfection, the fourth generation Kia Optima has emerged as a creation that is, at once, sophisticated and powerful. Boasting extensive enhancements and options including a luxurious color range, the Optima has been refined and perfected thanks to the foundation set by its predecessors. With the all-new Optima standing as the quintessential embodiment of style, innovation and power, Kia continues to set the bar and push the boundaries of conventional midsize sedans. We invite you to explore the all-new Optima and stay tuned for Kia’s further advancements in excellence! 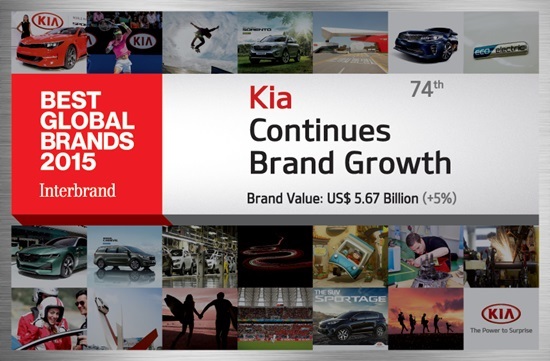 We are proud to announce that Kia stands proudly at number 74 on the international brand consultancy Interbrand’s 2015 list of 100 Best Global Brands. 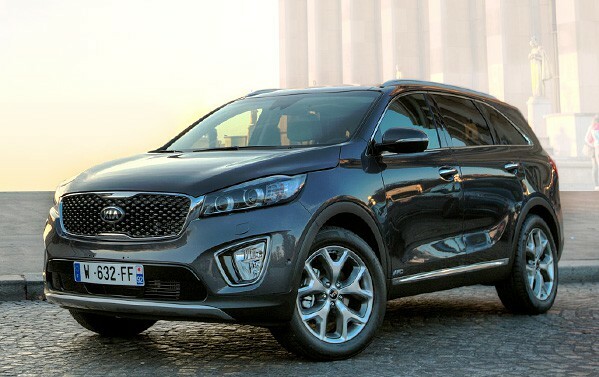 Interbrand attributes this remarkable growth to Kia’s dedication towards “excellent design, high quality and innovative brand management in the global markets.” Kia has also earned a number of other accolades this year. Earlier this year, we were honored with number 1 position among mass market brands inJ.D. Power’s Initial Quality Study (IQS), while the Soul EV, our first globally sold electronic vehicle, was crowned Car of the Year in Norway and Best Eco-Friendly Vehicle via MotorWeek’s 2015 Drivers’ Choice Awards. We are incredibly grateful for the recognition and will strive to strengthen the brand by providing global fans with innovative products and value-added service! L-R: Publisher, Onwheels Magazine, Jabez Aina-Scott and the Group Managing Director, Kia Motors Nigeria, Jacky Hathiramani, at the award presentation. 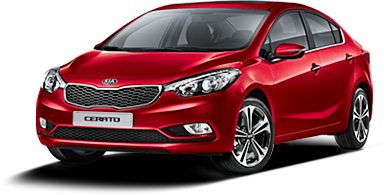 Kia Motors Nigeria has over the years earned a remarkable reputation in offering the best in class automobiles that continuously set the pace and remains at the fore of innovative products to exceed the expectations of customers at all touch points. As recognition for its accomplishments in the Nigeria auto industry, the company won the Most Innovative Auto Company for the year while it’s Group Managing Director, Jacky Hathiramani bagged the leadership and Kia Picanto was named the Budget Car of the year in the 2015 Nigeria Auto Award. It was indeed a remarkable feat for Kia Motors Nigeria to come out on top of all auto companies for its second to none innovative strides in sales and world class accentuated after sales service. “Winning innovative company award like this is testament to the thought that goes into all our strategic planning geared towards giving the best service to our esteemed customers and ensuring we offer not only the most reliable and durable vehicles, but also the most cost-effective top-of-the-segment models” said Sandeep Malhotra, Chief Commercial Officer, Kia Motors Nigeria. 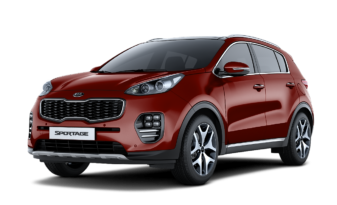 The success of the Kia brand in Nigeria is hinged on a team of outstanding professionals and their unalloyed commitments are rooted in positioning the brand as one of the industry leaders with exceptional satisfaction to customers. The team led by Jacky Hathiramani, Managing Director, has left no stone unturned to offer tailor-made propositions to customers. 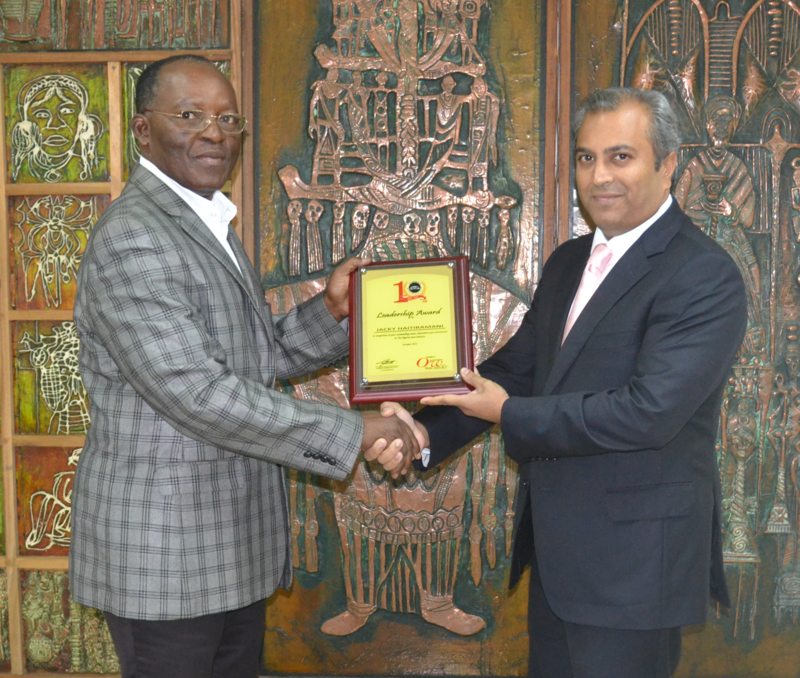 Recognized for his leading role in the Nigeria auto industry, Jacky was awarded the prestigious Leadership Award. He has steered the company to its current status as a leading player and his presence has seen Kia brand increase its turnover manifold in the country. Admired for its practicality and fun design, the Kia Picanto triumphed among other competing brands to win the budget car of the year. 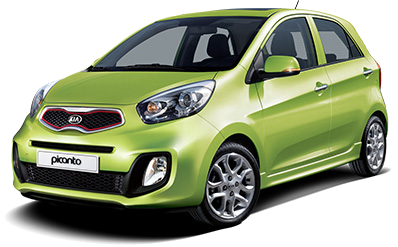 Kia Picanto’s affordability is easy on customers’ budget, fuel efficient and maneuverable in cramped city streets or parking lots without compromising value for a guaranteed exhilarating driving experience. 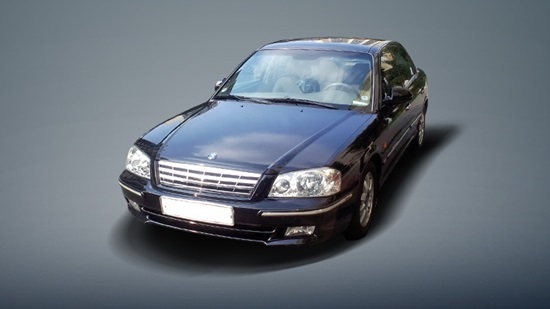 The entry level car has all the practical advantages of a small car as well as a fun-to-drive personality on the road. “We earned the awards through our outstanding professionalism and commitment to quality,” said Jacky Hathiramani. “Our team has continued to work tirelessly in ensuring exemplary standards of performance in sales and service, and most importantly, in satisfying our customers’ needs. We are proud to receive these awards as they are tribute to excellent customer relations in sales and service and we will continue to offer top-notch services for our esteemed customers”. 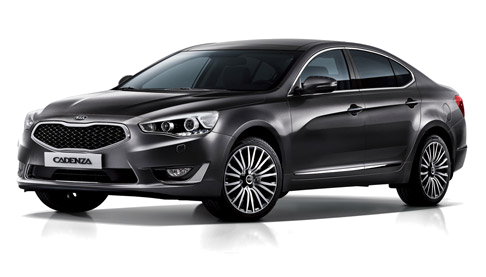 For the past decade, Kia has demonstrated absolute commitment to maintaining high standards for customer satisfaction. Offering top quality cars is, of course, the first step – but only the beginning, Kia Motors Nigeria strives to match the quality of their products with the finest service in the industry.